Below are Box Office Collection Report of bollywood film 'Ittefaq' With his review, budget and total box office and worldwide collection status. 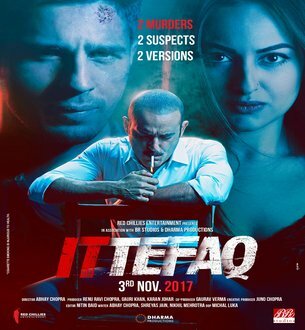 Ittefaq is an indian Mystery, Thriller Film of 2017. The movie lead star cast is Sidharth Malhotra, Sonakshi Sinha. Directed by Abhay Chopra and produced by Karan Johar, Gauri Khan. Many reasons, the film is expected to do well at the box office. The remake films released in the past have earn good money, as is the case with the film. Trade analyst Girish Johar feels that the film team has done a great job to promote the film. The film trailer has already got enough publicity. If the response of the film is good then it will definitely earn 15 to 18 crores in the first week.